Nothing ever happens in Little, CA. Which is just the way Carter Moon likes it. But when Hollywood arrives to film a movie starring former child star turned PR mess Adam Jakes, everything changes. Carter's town becomes a giant glittery set and, much to her annoyance, everyone is starry-eyed for Adam. Carter seems to be the only girl not falling all over herself to get a glimpse of him. Which apparently makes her perfect for the secret offer of a lifetime: playing the role of Adam's girlfriend while he's in town, to improve his public image, in exchange for a hefty paycheck. Her family really needs the money and so Carters agrees. But it turns out Adam isn't at all who she thought he was. As they grow closer, their relationship walks a blurry line between what's real and what's fake, and Carter must open her eyes to the scariest of unexplored worlds - her future. Can Carter figure out what she wants out of life AND get the guy? Or are there no Hollywood endings in real life? 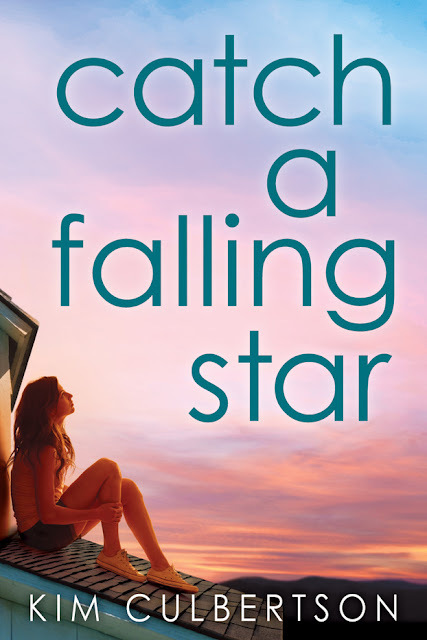 Catch a Falling Star had an interesting premise. I liked the concept of Hollywood going to an unpopular location to film, and the idea of a famous guy falling for a regular girl. It's a cute story with some sweet moments, along with some scenes that made me cringe. Carter was a likable character. She was a young girl coming into her own, but with the troubles of her brother and not believing in herself enough, she made the decision to remain in her small town instead of going after her dreams. And I like that her parents finally had that talk with her and made her open her eyes. As for Adam Jakes, he was swoon-worthy. A misunderstood guy. We all know that tabloids fabricate stories so I was a little surprised that Carter, along with her friends, bought so much into his supposedly "bad-boy issues." Speaking of friends, I honestly thought Alien Drake (I did not like that nickname) was jealous of Adam and Carter. He just seemed kind of off, then again any boyfriend would be upset with the way his girlfriend, Carter's other best friend, would go all fangirl over Adam. Chloe was a lot. I wanted to smack her at times and tell her to chill because of the way she was around Adam. No wonder he was a tad put off when she brought out the magazine with him and Carter on the cover. Like relax girl. Anyway, in spite of those few things, it was a good read with fluid writing. Loved the summer setting and the way things worked out for the characters in the end. Cute story. Kim Culbertson is the author of the teen novels THE POSSIBILITY OF NOW (Scholastic 2016), CATCH A FALLING STAR (Scholastic 2014), INSTRUCTIONS FOR A BROKEN HEART (Sourcebooks 2011), and SONGS FOR A TEENAGE NOMAD (Sourcebooks 2010). When she’s not writing for teens, she’s teaching them. She’s a college advisor and teaches creative writing at Forest Charter School. Kim wrote her eBook novella The Liberation of Max McTrue for her students who, over the years, have taught her much more than she has taught them. Kim lives in the Northern California foothills with her husband and daughter. I read this book because I've always been a sucker for those actors/regular person romances. Lol. This was enjoyable enough, but I thought it could've used a bit more swoon. Glad you enjoyed it, Shane!